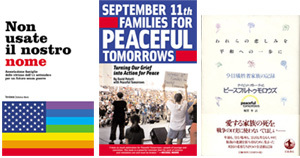 September 11th Families for Peaceful Tomorrows: Turning Our Grief into Action for Peace” tells the story of how we came together to form the group, and how we have struggled to keep our losses from being used as a justification for further violence and terror. Written by David Potorti, along with original essays from members of the group including Ryan Amundson, Myrna Bethke, Derrill Bodley, Kelly Campbell, Colleen Kelly, Rita Lasar, Kristina Olsen, Andrew Rice, and Terry Rockefeller. This soft cover book is 250 pages and retails for $14.95 with a percentage of the proceeds supporting the work of Peaceful Tomorrows. An autographed version of the book is available for an additional donation and is available by clicking here. It’s published by RDV Books/Akashic Books and is available through local bookstores or online through Akashic Books, BookSense, Amazon, Barnes and Noble, Powell’s, or other book outlets. It’s available to the trade through Consortium Book Sales & Distribution and other major wholesalers. ISBN 0-9719206-4-8. Our work has also been recognized internationally! The Peaceful Tomorrows book has been published in Japanese and Italian. In March, 2005, it will be released in Spanish.